Green Lantern feels like the superhero equivalent of post-Twilight takes on fairy tales and monsters. It thinly applies a veneer of "edge" to an iconic, cheesy hero, turning an emblem of fearless resolve into a smarmy, insecure prat whose defensive one-liners and daddy issues make for nothing more than trendy add-ons. The film's hero can make power from will, but a less energetic comic book movie I've yet to find. The whole thing looks as if it came out of a gumball machine, tacky, bright and brittle, capable of being snapped in half with the slightest effort. Ryan Reynolds is horribly miscast as Hal Jordan, communicating none of the character's traditional characteristics and awkwardly trying to deepen the character with daddy issues. None of the other actors does any better, trapped in tossed-off roles so thin they make even the lazy etch of this Green Lantern seem deep. And while plot holes can be an easy way to focus on all the unimportant things in a film, Green Lantern is scripted with shocking half-assedness, always taking the simplest way to the next scene without remotely resolving anything. Nearly every single action Jordan makes is nonsensical, and the weightless CGI only complicates the feeling of drifting aimlessness. The 1080p, AVC-encoded transfer is surprisingly murky, casting the slickness of the production in dim light. I felt as if I'd somehow gotten a 3D copy by mistake and my tv miraculously played it anyway. In fairness, though, I can't remember if the film itself looked like this in the theaters: using darker lighting has been an easy way to disguise horrible CGI for nearly two decades at this point, and if there's anything Green Lantern has in spades, it's bad effects. Much better is the booming 5.1 Master Audio track, a boisterous affair so loud I could clearly make out distinct music, sound effects and dialogue on my TV's lowest setting before mute. This audio track is so good it's the only thing on the Blu-Ray worth paying for. The centerpiece of the disc is one of Warner's Maximum Movie Mode video commentaries, driven by Geoff Johns, the DC writer who spearheaded Green Lantern's popular revival in the comic book realm. Stuffed with additional featurettes that can be optionally played during the course of the commentary, this Maximum Movie Mode is most notable for the portrait it paints of a lot of people with an admiration, maybe even love of the comics but no ability to see how rapidly they were drifting away from the crux of those books. It's also filled with absurd moments of false modesty such as Reynolds saying of the pressure he felt during the scene where he says the Lantern Corps oath for the first time, "People know this oath inside and out." It's four lines, long, Ryan. That's one-third more time-consuming than learning a haiku. The most depressing aspect of this MMM, though, is how many behind the scenes images are merely half-developed CGI. Reynolds gets in an unintended dig when he says of a bunker set that he finally got an idea of the film's scale because there was something tangible to look at. The rest of the extras are the usual filler, with some deleted scenes, background info on the comics and even a digital comic of the new Justice League series. 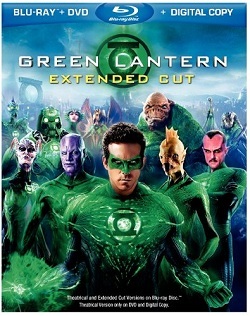 My favorite of these lesser extras is the unfortunately titled "Ryan Reynolds Becomes Green Lantern," if only because the actor was forced to change not an ounce of his usual approach to play this part. I don't think it's as bad as people said it is but it's clear that it feels unfinished. The visual effects were terrible. I do like Ryan Reynolds but he was so wrong for the role. I was more annoyed by Blake Lively who isn't a very actress at all. Peter Sarsgaard spends half the film screaming like a girl while a lot of the film's action sequences and such reminded me of those awful Fantastic Four movies.